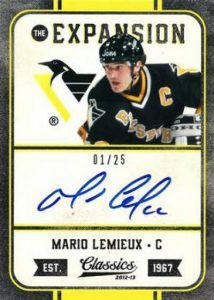 Flashback Friday: 2012-13 Panini Classics Signatures Hockey	Overall rating:	0	out of 5 based on 0	reviews. Ok, so I know that it is Saturday, I just didn’t have the energy to finish this yesterday. So here we have a slightly delayed Flashback Friday. This weeks voyage back in time is taking us on a short hop back to 2012 and the gorgeous product that is Panini Classics Signatures. This fun collection of cards rejected the rookie obsession in order to focus almost exclusively on retired stars. While some collectors reject the idea of a rookie-less product, the legends collectors like myself breath a sigh of relief. With a solid base set and the promise of one autograph per pack, Classics Signatures remains one of my favorite products to open. For base collectors Classics Signatures can be a bit misleading. The cards are number from 1-200, but in reality there are only 173 cards in the set, meaning that some numbers are skipped. This unfortunately leads to holes in binder sets, but there isn’t really anything we can do about that. I personally haven’t heard any reasonable explanation as to why this was done, but I do have a theory. 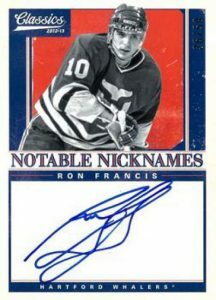 Panini has a long history of re-releasing update sets in other products, most notably Rookie Anthology, this was probably the intent for Classics Signatures. However, if this was the plan it was derailed by the loss of licensing and the granting of exclusivity to Upper Deck. If this was the case we can only hope that they will someday get their license back and finish the set. Now, we could sit here and ask hypothetical questions all day, but that would be boring, so let’s look at cards instead. Taking a look at the base set, we see a simple, but comfortable design. These is nothing flashy about it, and it reminds me of the cardsets of the 1960s and 1970s. 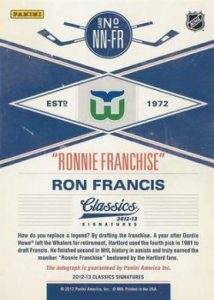 The front of the card features the team name across the top, along with the team logo, and player’s name. 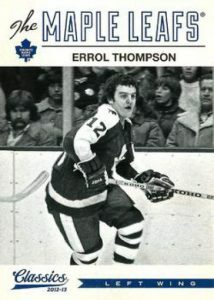 The player photo varies according to the era in which they played. Older players are more likely to have a black and white photo, as this is all that existed at the time. This, I find, helps to add class to the set, and respects the heritage of the featured players. 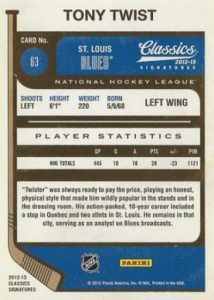 The bottom of the card has the product name, alongside the player’s position. All of this set against a white cardstock. Turning the card over, we see a well organized back section. Bordered with a hockey stick, the card provides all the relevant information. Player name, card number, team, player bio, it’s all included. The card is highlighted in the team’s colour and is a simple but effective design. I honestly wish more card companies went with simplistic layouts rather than the gaudy foil monstrosities that we see everywhere. Before we move onto the plethora of autograph sets we must take a glance at the one true insert set that Classics Signatures provides. 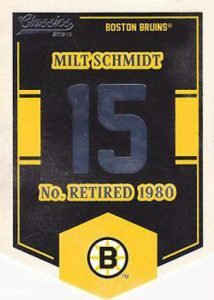 The Banner Numbers set provides cards that are die-cut to resemble the retired number banners of players from across the league. The set, meant to pay tribute those players whose numbers have been retired, or honoured as is the case with some teams, has a total of 75 cards. 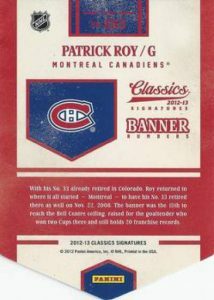 Each pack of Classics Signatures contains one of these cards, usually the last one in the pack. This is a great insert set that shows respect to those players who made the game great. The first of 10 different autographs sets, the base autos are exactly that, base cars that have been signed by the player in question. As is the case throughout the product these cards are hard signed, meaning this is a no sticker zone. Panini does its best to include as many players as possible for this set with 149 of the 173 original base list being autographed. This means fans have the chance at autographs from Gordie Howe, Dale Hawerchuk, and Henri Richard, among others. While not all the names on the list are mega stars, many of them are names that we see far too rarely in today’s products. Collecting this entire set would be a tall order, but a very fulfilling one in the end. The second autograph set that bears examination is the Classic Combos Dual Autographs set. 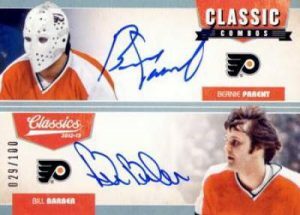 This set promises, as the name suggests, two hard autographs on each card. 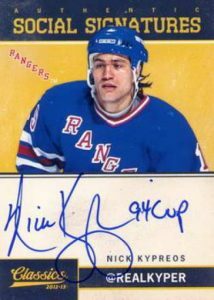 This 19 card list contains a variety of different combinations such as Phil Esposito & Ray Bourque, or Doug Gilmour & Wendel Clark. These are good looking cards that give equal recognition to each player, both on the front and on the back. With no card being serial numbered higher than 100, this would be a nice set, without too many mega stars to drive the price up. The second of the two Classic Combos sets to appear in Classics Signatures, the triple autographs are limited to no more than 50 copies each. The 7 card set features 6 sets of NHL teammates, and an all USA combo of Jim Craig, Ken Morrow, and Neal Broten. These cards look very similar to the dual autographs, with the obvious difference being three autos instead if two. 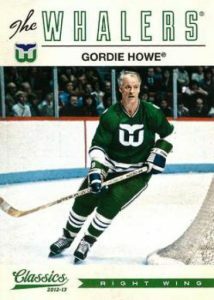 The name combinations for this set are a bit more distinguished than its predecessor, meaning that collecting the set will be more costly on a per card basis. 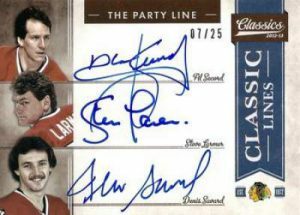 The second set of triple autographs once again focuses on teams, but this time specifically it focuses on specific lines. These lines were famous in their time, and often earned suitable nicknames that fans everywhere knew them by. These include the Party Line of Al Secord, Denis Savard, and Steve Larmer for Chicago, and the Stastny line of Anton, Marian, and Peter Stastny for the Nordiques. The set is helps to educate younger collectors on some of the legendary lines of the past, and get them interested in the history of the game. With 7 cards on the checklist, all serial numbered 50 or less, this could be a challenge to collect. This next set happens to be one of the nicest looking in my opinion. The cards honour NHL Hall of Famers by giving details of there induction ceremonies. The card fronts boast bright team colours and a plain white autograph zone. The hockey stick on the front unfortunately does not contain an actual stick, but looks cool anyway. 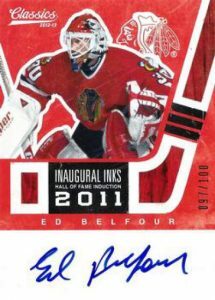 On the backside of the card we have the date of induction to the HHOF, as well as some details about that year’s class. 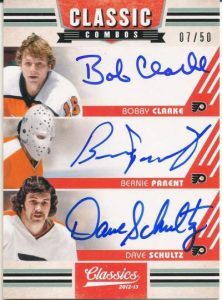 These are great looking cards that guarantee collectors some Hall of Fame autographs. Next up we have the Notable Nicknames set. This, in my opinion anyway, is one of the less attractive sets of the product. The front features a large blank space for the autograph, while the actual colours appear dull and faded. Since the set focuses on the nicknames of certain players, you would expect the nickname to be prominent, however it doesn’t even appear on the front of the card. The nickname does appear on the back of the card, but this doesn’t make-up for the lackluster front. Definitely one of Panini’s poorer sets. Ok, so I apologize for the lack of photos on this set, but I can’t find any. The set consists of 25 cards, all of which are 1/1 . 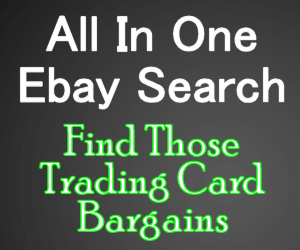 These types of cards always seem to sell high, since they are usually reserved for stars who have died. As a result we see names such as Gump Worsley, Toe Blake, and Conn Smythe among the potential pulls. These are definitely a card I would love to pull, regardless of which player. 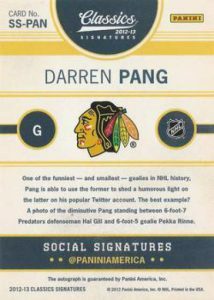 Usually Social Signatures is one of the sets that I most enjoy seeing in Panini products. These cards offer up some nice autographs, and embrace modern technological platforms. However, this particular edition of the set is one that I have never really liked. The combination of a product honouring veteran players seems to clash with a set that is usually focused on young stars. Additionally the layout of the cards just seems clunky and unimagined. I wish I could like this set as much as I do other Social Signatures, but it’s just not working for me. Fans of the Original 6 may not be interested in this set, but the rest of the league will be. As the name suggests, The Expansion pays tribute to teams that came into being as the result of expansion. 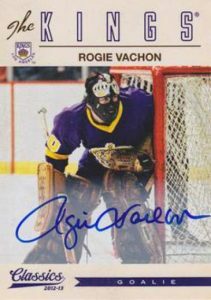 While some of these teams such as LA or Pittsburgh, have had great success, others such as the North Stars or Golden Seals failed to survive. These card are not the best looking in the set, but definitely not the worst either. Big names include Mario Lemieux, Rogie Vachon, and Eric Lindros. Acting as a counter to The Expansion set, The Original focuses exclusively on the the Original 6 and their great names. This means Guy Lafleur, Came Neely, and Gordie Howe all make an apperance. 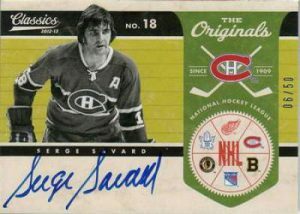 The set also included a redemption for Jean Beliveau, but they did not get made prior to his death and therefore will not be fulfilled. I very much like the layout of this set, with the front incorporating the player, auto, and banner image quite well. The backside of the card does not ignore the other five original teams, and is well laid out for easy reading. This is definitely on of my favorite sets in Classics Signatures, as well as the only one of the autographs that I currently own. While this weeks Flashback may not have taken us as far back as previous editions, I feel that it was none the less important. Classics Signatures is a product that honours players of past eras, which to me is a very important aspect. With all the focus that modern products put on rookies, it is nice to know that veterans still have their due. Well done Panini, please come back to us.